Last Updated: November 29, 2018 · Published: October 29, 2018 By: Asian Caucasian 16 Comments This post may contain affiliate links or sponsored content. 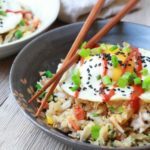 Fried rice is practically a staple in Asian cuisine, and some of us choose to stay away because of the calorie content in traditional fried rice recipes. All that’s changed since the introduction of healthy cauliflower rice! Have you tried cauliflower fried rice yet? Here’s a super flavorful recipe that will have you convinced that it’s the real deal — my Easy Cauliflower Fried Rice with Crab! This easy recipe requires a wok (or large frying pan) and the usual ingredients in fried rice (except for the rice! ): carrots, onions, garlic, peas, cauliflower rice, scallions, and a bit of lump crab meat for protein. PLUS, I added a few fried eggs on top! 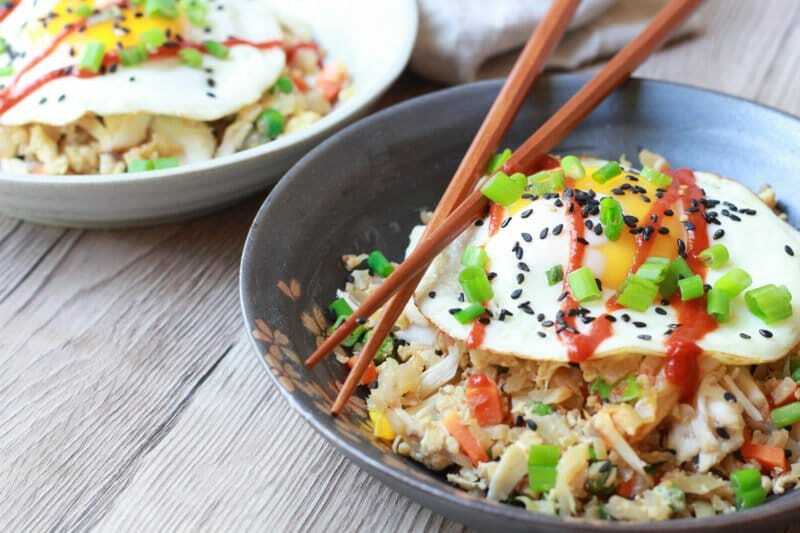 Break into those yolks for even more flavor in this delicious “healthy” fried rice! Cauliflower rice is pretty much available everywhere these days. It used to be hard to find, like only at Trader Joe’s. Then the craze caught on and they are in practically every freakin’ grocery store! Check the freezer section or you can often buy it fresh in the produce section. 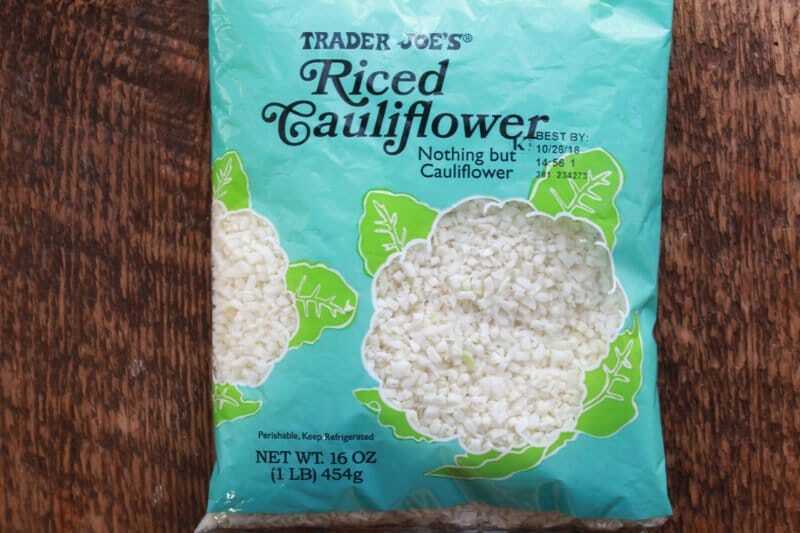 This bag of fresh riced cauliflower is from Trader Joe’s. I also buy it frozen in the bag. 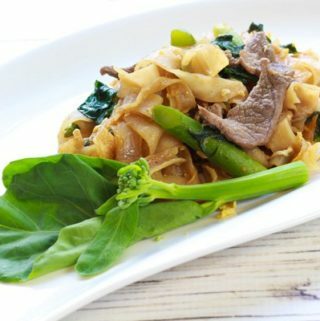 If you buy it frozen, make sure to squeeze out any liquid before using it in your stir-fry. Get all of your veggies chopped evenly (mise en place) and ready to go. Heat your wok on a high heat and add in your veggies, stirring constantly, until just wilted. Add in the cauliflower last! Push the veggies to the side of the wok and scramble the eggs on the cleared side. Once scrambled, mix the eggs into the stir-fried veggies. Add in the crab and the sauce ingredients and stir-fry a little while longer until fully incorporated. Meanwhile, fry two eggs, sunny-side-up. Sprinkle the stir-fry with black sesame seeds and chopped scallions. Add the fried eggs on top and drizzle with sriracha sauce. 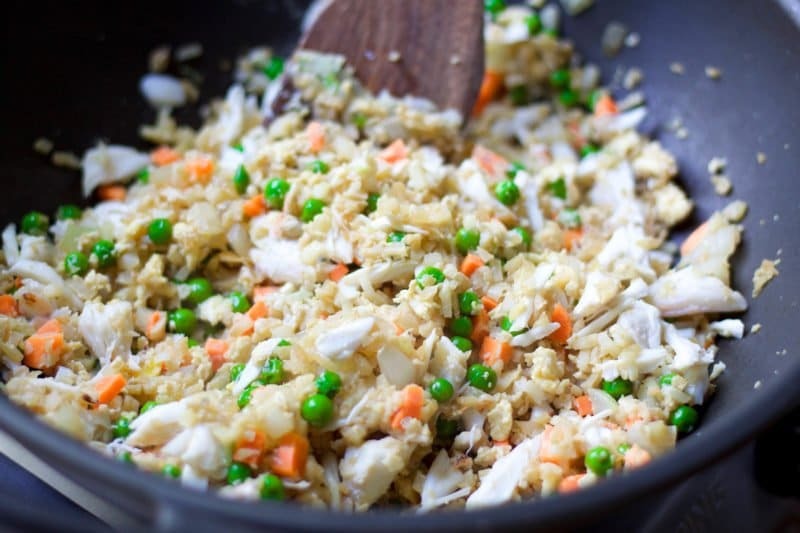 Look at those pieces of lump crab meat in this Easy Cauliflower Fried Rice dish! 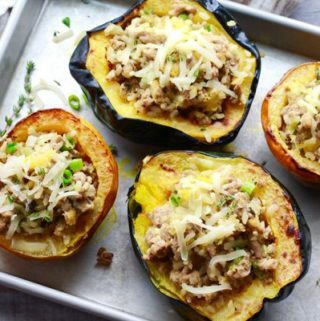 You can add any protein you’d like in this dish and it will work just as well. Or, make it vegetarian and leave it out (unless you opt for tofu which would be delish!). This healthier version of fried rice will make you wonder why you weren’t using riced cauliflower all along! 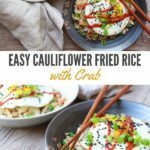 This Easy Cauliflower Fried Rice with Crab is so good! Heat the sesame oil in a well-seasoned wok or large nonstick skillet over medium-high heat. Swirl to coat the pan. Add the garlic, onion, and ginger until fragrant, about 2 minutes. Add in the carrots, peas and cauliflower rice and cook, stirring another 2 minutes. 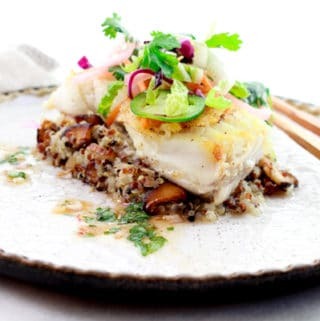 Add in the liquid aminos or soy sauce, sesame oil, fish sauce, and pepper and cook, stirring often, for 2 to 3 minutes. 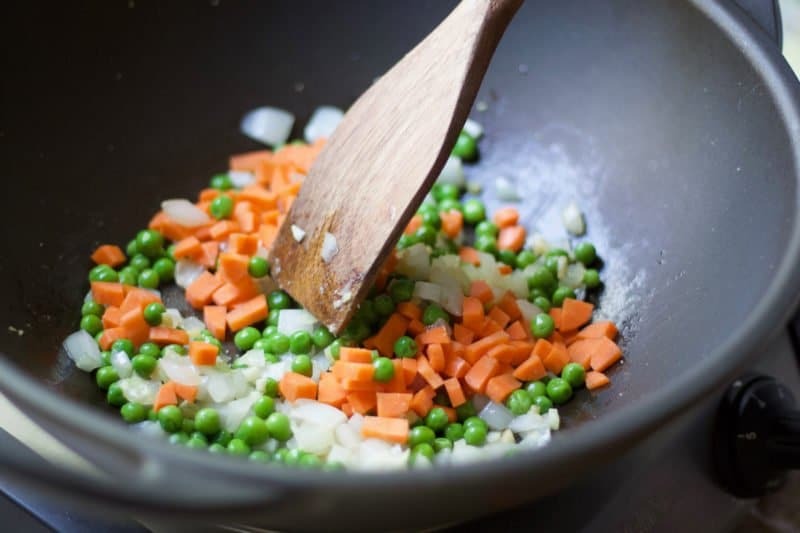 Push the vegetables off to the side of the wok or pan. Add the beaten eggs to the open side and cook until scrambled. Gently toss the scrambled eggs and crab meat into the veggies. Meanwhile, in a separate frying pan, fry the two large eggs until sunny-side up. 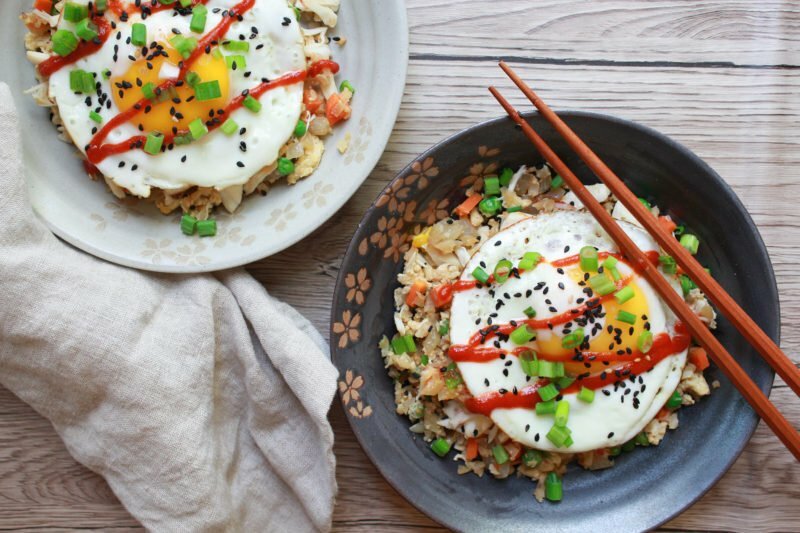 Place the fried eggs over the fried rice and drizzle with sriracha sauce, if desired. Garnish with the scallions and sesame seeds, and serve immediately. 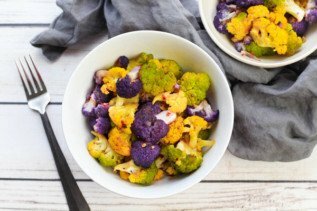 If you liked this recipe, try our Sweet and Spicy Tricolored Cauliflower. This is my kind of dinner! Looks delicious! Thanks, Lindsay! This pizza is super easy and tastes delish with the delicata squash and prosciutto combo! Sure! Would love to share, Helen! 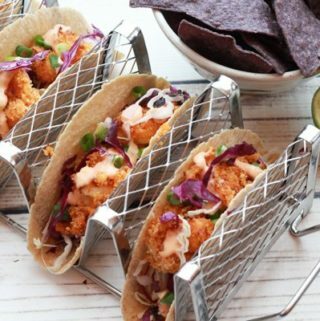 This this cauliflower fried recipe would be great for your What’s for Dinner party! I haven’t tried cauliflower rice yet, but after reading this I think I shall add it to my shopping list! 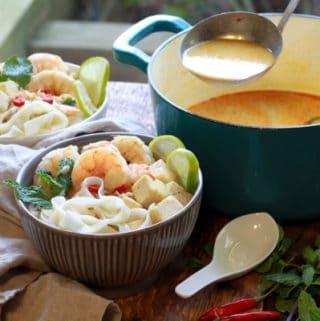 These flavours and textures sound wonderful! Great, Nicole! I hope you’ll give cauliflower rice a try! I happen to use it all the time. 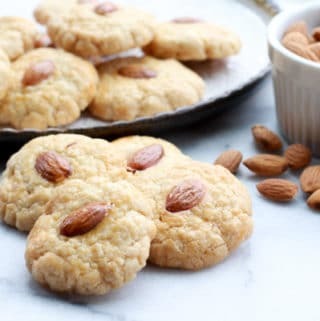 There are some great recipes you can search for with this low-carb ingredient! Thanks, Julie! I’ve riced my own cauliflower before but now the stores make it so easy for you! I do prefer to buy the fresh riced cauliflower because it’s not so wet. You’re very welcome, Loyola! I love using cauliflower rice in so many dishes. Fried rice is among the best usage! We love fried rice, especially at breakfast. Glad I found this recipe, can’t wait to try this healthy option. Thanks for sharing this. Thanks, Arjhon! I hope you like this version of fried rice. 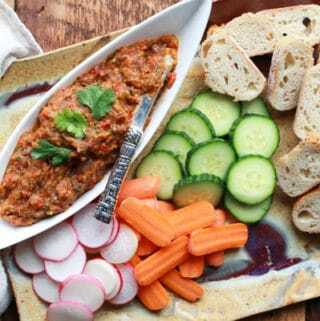 I happen to think it tastes like the real deal but low-carb and so much healthier! Yumm! 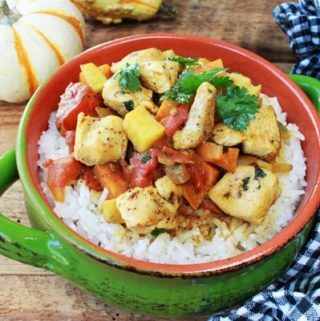 This looks so delicious and FULL of flavor! I love the beautiful color of the eggs, sriracha and black sesame seeds! With that said, I think I would just scramble the eggs since I know my 2 year old son will not want to eat a sunny side up egg!! Thanks for the recipe! Great idea! Anything to get some protein in there! I love eggs prepared any which way so scrambled on top of the fried cauliflower rice would be amazing! I love this! The combination of all these flavors sounds amazing, crab is my favorite… I can’t wait to try out this recipe! Thanks, Amy! I absolutely loved making this “healthy” cauliflower rice dish, so fast and easy. 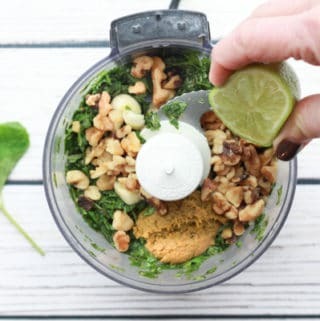 You can add whatever protein you want!